The beginner’s guide to Evidence-based Practice for Nursing, Health and Social Care. An Introduction to Evidence-based Practice in Nursing & Health aims to help students, educators, mentors and professionals to make sense of knowledge derived from research and how to use it as a basis for making sound decisions about patient care. Covering everything from basic terminology to the application of Evidence-based Practice in your everyday routine, this text is the guide to better practice. 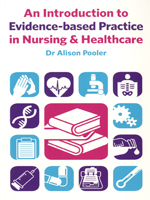 Written in a accessible and interactive style, An Introduction to Evidence-based Practice in Nursing & Health clearly sets out what Evidence-based Practice is, why it is important and how you can use it successfully to improve patient care. Simply and quickly shows you what Evidence-based Practice is and how you can use it. Helps you to develop an understanding of the policies driving Evidence-based Practice and professional development. Regular reinforcement of your learning through integrated Activities and end-of-chapter self assessment. Extensive references and suggestions for further reading and online research. Integrated Glossary keeps you up-to-date with the latest jargon.